Photo given by Vaughn Plott in 1972. Vaughn was my 2nd cousin 3x removed. Herbert was my 2nd cousin 3x removed. My fourth great grandparents, Henry Plott and his wife Lydia Osborn-Plott, with their eleven children and extended families lived within the slopes of the Plott Balsam Peak Range. About 1809, Henry moved his family to Haywood County from Cabarrus County. During 1858 through 1860, there were a lot of discussions on the elevations of the southern Appalachians and, to which, peak had the highest elevation. 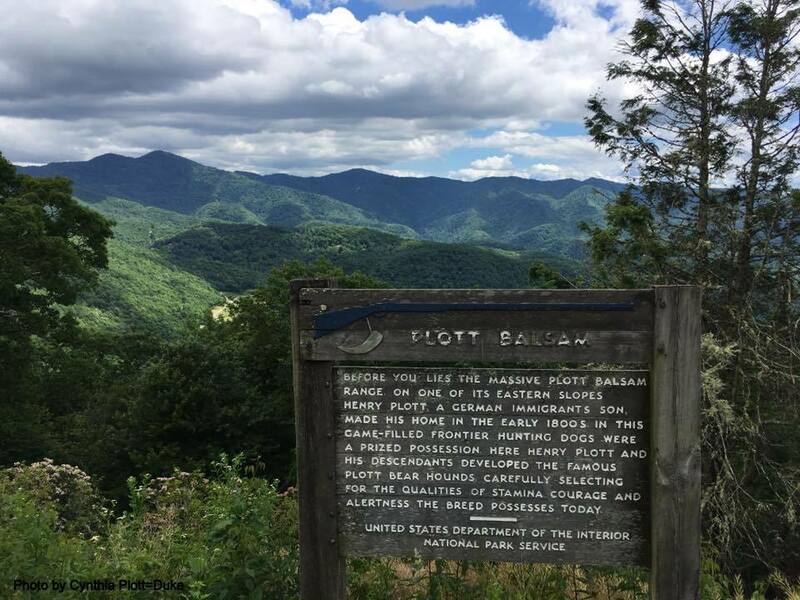 Although Plott Balsam or a particular Plott peak does not have the highest elevation, the Plott Balsam or particular Plott peaks would be referenced in the newspaper articles. ​In the Thursday, October 7, 1858, page 3, Asheville News in North Carolina, Plott Balsam was mentioned in an article "Black Mountain Dethroned!". The article reports information that, "...the highest peak of the Smokey Mountains (is) Mount Clingman, ...". 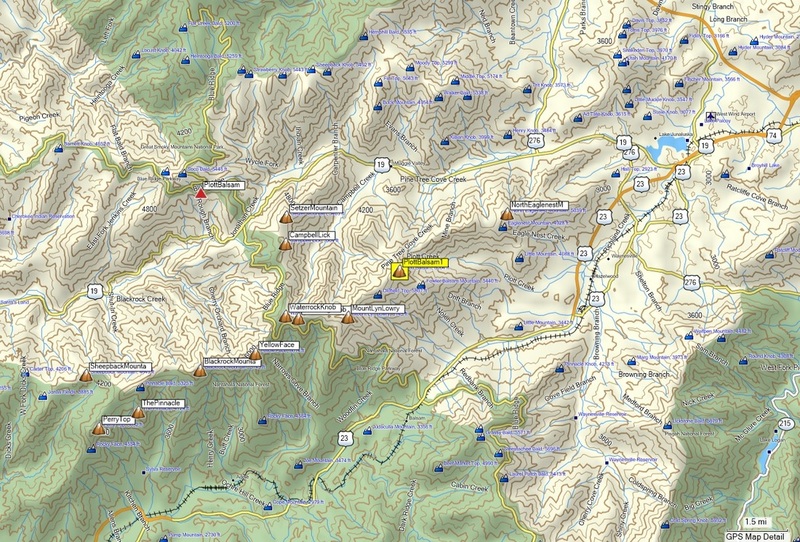 Within the article about Mount Clingman being the highest peak, it mentions "... the Plott Balsam (the point nearest Waynesville) S. 78 E., ...". In the Thursday, December 2, 1858, page 3, Asheville News in North Carolina, John LeConte wrote a letter to the publication. Professor LeConte was scientist and physicist, who also measured the elevations of the local mountains. Within his letter, Professor LeConte wrote, "BALSAM RANGE, Nearest peak (Plott's peak) south-west of Waynesville; height above the sea, 6,160 feet." In the Friday, January 18, 1859, page 1, The North Carolina Whig, Edward J. Aston wrote a letter to the Editor of the New York Herald. The letter was dated November 19, 1858. Within Mr. Aston's letter, he provided a memorandum that was furnished by Professor Buckley, which mentioned the following, "Amos Plott's Balsam, near the head waters of Jonathan's Soco, and Scott's Creek's, 6406 feet." In the Friday, February 11, 1859, page 4, The Greensboro Patriot, S. B. (Samuel Botsford) Buckley wrote an article title "Grasses in N. Carolina - Danthonia Glumosa." Mr. Buckley was a scientist and a naturalist. Within his article he wrote, "The Danthonia Glumosa grows in dense luxuriance, with long radical leaves, forming a thick pasture resembling that of the Kentucky Blue Grass, (Poa pratensis,) on many of the higher mountains of North Carolina. I was told that it is an excellent winter grass, and much relished by both cattle and horses. It was common on Plott's Peak and Jones' Peak, two high mountains about six miles south-west of Waynesville, in Haywood county, N.C."
Henry, his sons, sons-in-law and extended family members owned a lot of land in the Haywood County area. Several land grants and deeds can be found in the Haywood County, North Carolina archives and proven in the Haywood County Court of Pleas & Quarter Sessions. Henry and Lydia Plott set a high standard and reputation in cultivating their children with strong ethics. Henry, all of their sons and all of their sons-in-law were mentioned numerous times in the Haywood County Court of Pleas and Quarter Sessions for fulfilling jury duties, assisting with estate settlements, government jobs, and working on road crew details. Osborn Plott served as juror during several sessions, worked on road crews and was overseer on several road crews. George Plott served as juror during several sessions, assisted with estate settlements, worked on road crews and was overseer on road crews. Amos Plott served as juror during several sessions, for a time was the guard of the jail, assisted with estate settlements, executor to David Davis estate, inspection of elections, and worked on road crews. Enos Plott served as juror during several sessions and worked on road crews. Jonathan Plott served as juror during several sessions, was the Haywood County trustee, worked on road crews, was a Justice of the Peace presiding over court & elections, and appointed as a delegate to the 1858 Democratic State Convention. David Plott served as juror during several sessions, proved different documents to court, inspection of elections, worked on road crews, was a Justice of the Peace presiding over court and appointed as a delegate to the 1858 Democratic State Convention. Col. Henry Plott, Jr. served as Commissioner supervising the building and the jail of Haywood County (1838), was an Esquire, on the panel of justice of the peace judges, served as one of commissioners to superintendent to the building & the bridges on the state road to Pigeon, and served as one of the 1840 election judges for Waynesville. John Plott served on jury duty several time. Ezekiel Brown (Margaret Peggy Plott's husband) served on jury duty. Elias David Brendle (Celinda Plott's husband) served on jury duty; in September 1839, he became the Haywood County Coroner; and in September 1841, Elias Brendle was listed as one of the Justice of the Peace presiding over the session. Hugh Brown (Martha Caroline Plott's husband) served on several jury duties. More mentions to follow as I reel through the Haywood County Court of Pleas and Quarter Session microfilm rolls. 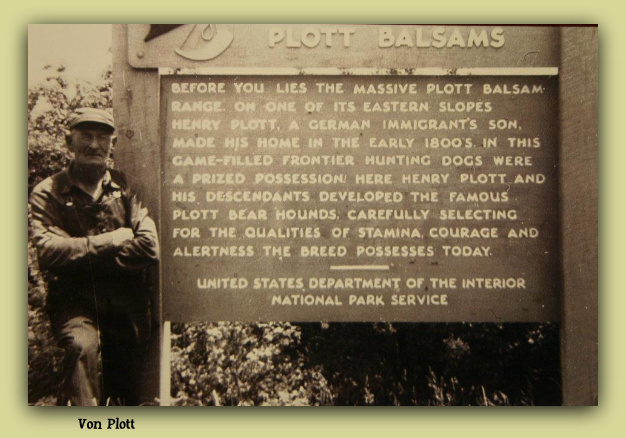 When you look out at the Plott Balsams landscape, please remember that ALL of the North Carolina Plott family members contributed a lot of historical legacies to the State of North Carolina beyond the Plott Hounds and beyond owning land in the Plott Balsams. They helped develop the early histories of Cabarrus County, Lincoln County, Iredell County, Haywood County, and others. ​Henry, his sons and sons-in-law would have hunted the area with the famous Plott Hounds. In the September 1831 Haywood County Court of Pleas and Quarter Sessions, Henry registered his livestock ear markings for his animals to roam his plantation land. This type of animal branding allowed his neighbors to know his particular stock ownership. "Fee Pd. Henry Plott made application & is permitted to have his mark recorded which is and under bit under skull on right Ear & a slit in the left Ear." "Fee Pd. Henry Plott made application & is permitted to have his mark recorded which is and under bit under skull on right Ear & a slit in the left Ear." The animal's right ear had a under bit cut and the animal's left ear had a slit cut in it. Henry's parents, (Johannes) George and Margaret Plott, never lived in Haywood County, North Carolina. At most, George and Margaret may have visited Henry's Haywood County home. Please remember that (Johannes) George Plott was maturing into his senior years and died in 1815, which was five years after Henry purchased Haywood County property on March 12, 1810 from John Welsh. George and Margaret Plott first lived in Cabarrus County in 1767; then, moved to Lincoln County in 1797, where he died. Margaret died in Iredell County, while living with their son, Elias Plott. For a larger image of the below panoramic photo of Plott Balsam, please click on the photo or here. 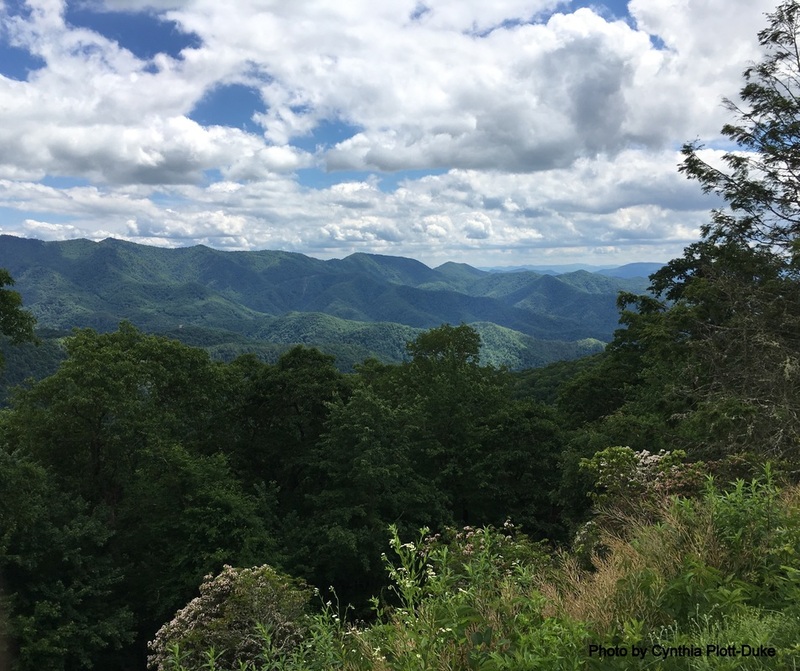 You will be transferred to Master Views, Blue Ridge Parkway, Section 4, Plott Balsam. Plott Balsam is to the left with the red asterisk over it. Article 1 of 2 - Although there was an error of George Plott's beginning years in America, the article provides information about the Plott Early Settlers and the Plott Range. Modern technology has uncovered archival level information about George Plott's beginning years in America. Click on the below green button to open, read, save and/or print or HERE.